As we watch the sun set on 2015, I can't help but wait with anticipation for the sun to rise on the new year. This past year was a really busy one, and while I don't see signs of that changing in 2016, I do hope to find a way to make more of an effort to connect with nature on a regular basis. I discovered my need to use nature photography as a meditation while in California for graduate school, and it's been exciting to see the recent articles (like the cover story for the January issue of National Geographic) supporting what I found to be intrinsically true. So as I look forward to 2016, I wish you all the best for a great year filled with family, friendship, love, and quiet time spent in nature! 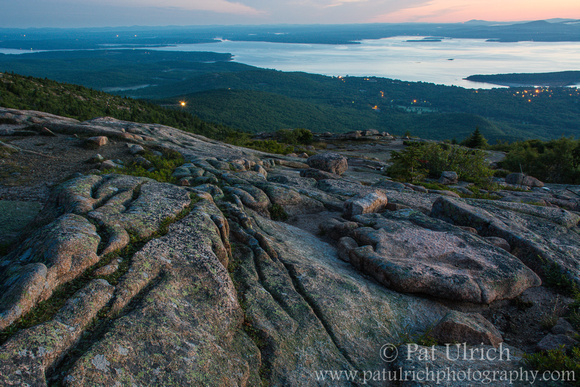 This image from the slopes of Cadillac Mountain was the only landscape I selected for my Favorite Photographs of 2015 post. I had previsualized a number of photographs that I hoped to work at on the trip, but the ever present coastal fog had other plans. For about 20 minutes on our first evening in the park, I had my only chance at seeing a sunset, and I think that this is my favorite frame from that experience. What was most surprising to me was how quickly the fog descended down from the summit of Mount Cadillac once the sun slipped behind the fog for the last time. 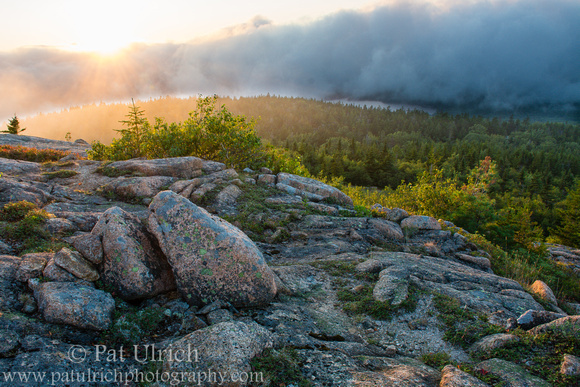 View more photographs from Acadia National Park. Bubble Pond was a location that we didn't see on our trip to Acadia National Park last year. The parking lot was rather small (maybe room for 10 cars? ), so it took a few tries before we were able to walk the carriage road along shoreline. Like most of the ponds in the park, the water was wonderfully clear with views of the rocky bottom. There was only a light wind crossing the pond when we started out, providing nice reflections as well -- offering a simultaneous view both above and below the surface. 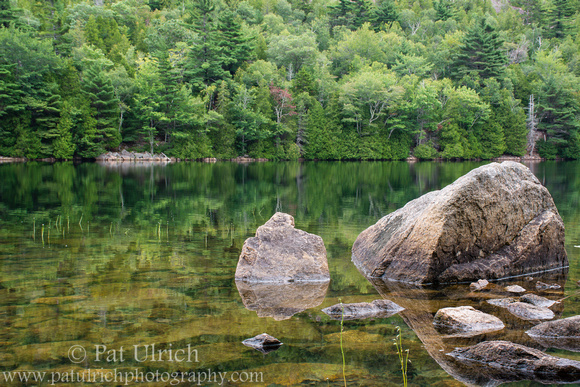 View more photographs of Acadia National Park. As I've written in my last few posts, this year's summer trip to Acadia National park was all about the fog. I had daydreamed about having the chance to photograph the warm colors of the sun rising or setting behind a bank of cool coastal fog -- and our first evening in the park was my only opportunity. We experienced all of the other sunrises or sunsets from underneath a heavy layer of coastal fog. It was a tenuous experience looking for the right location to catch the sunset at an elevation below the summit of Cadillac Mountain, which was fully shrouded in fog. The rolling moisture was ever-shifting, leaving some moments of deep, dark grey and others of clear views over the park. Thankfully, the fog that was slipping down the slopes from the summit stayed above our elevation during the last few minutes of the sun's descent toward the fog bank horizon. In fact, the constant motion of the fog gave me multiple opportunities to catch the "final" moments of the day -- after the sun had set, the fog would shift and provide another opportunity to watch the sun slip further behind. So even though I had only one evening to catch the sunset, at least I had a couple of rapid-fire opportunities at the time. It was surprising how quickly the fog covering the summit crashed down to our location after the sun slipped behind the foggy horizon for the final time. Just a few minutes after taking my last image for the day, we were full-on in a cloud, getting soaked by the heavy mist on the brief hike back to the car. 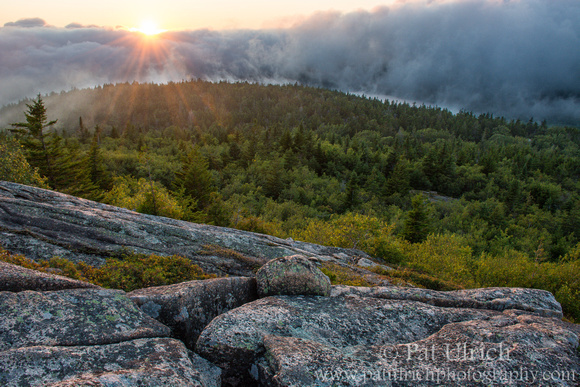 View more landscape photography from Acadia National Park. 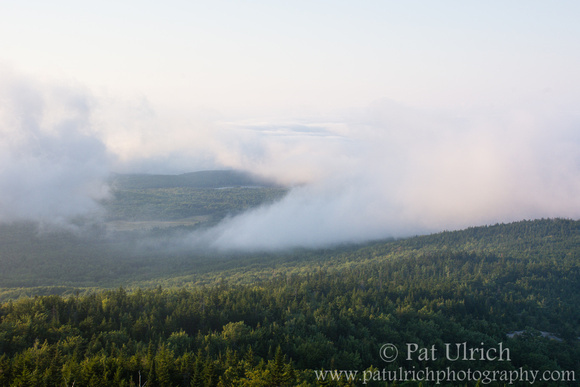 The fog was incredibly dynamic as it rolled across the landscape in Acadia National Park. As we awaited the sunset on the western slopes of Cadillac Mountain, the skies above and below us were constantly changing. One moment we would see far into the distance across Mount Desert Island, as in this image, and in the next moment we were fully enveloped in the fog. In fact, the photograph that I posted yesterday of a fog-shrouded scene was taken only 1 minute after this one! View more photography from Acadia National Park. 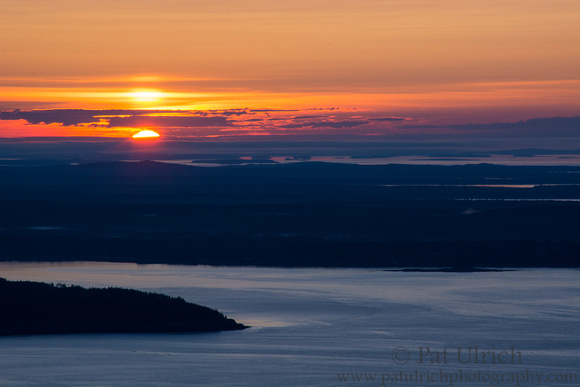 On our first evening in Acadia National Park this year, after enjoying some delicious crab and lobster rolls as our welcome to Maine dinner, we planned to drive up Cadillac Mountain for the sunset. As we approached the bridge to Mount Desert Island, we could already see that the summit was hidden by fog rolling in from the coast. However, the fog had not yet slipped all the way down the slopes, so some of the intermediate elevations were clear. We joined a fleet of cars parking in the pullouts along the road and awaited the sunset from the granite outcrops. In the hour or so we hiked around the area, the ever changing fog would bury us completely and then fade away with a steady rhythm. This photograph was taken at the edge of one of these mountain breaths, where setting sun cast a warm glow in the cloud of fog surrounding us. Earlier this summer, I wrote about how I was hoping we would luck out with the coastal fog on our annual trip to Acadia National Park. I had some images planned in my mind to shoot from the top of Cadillac Mountain above the marine layer as the sun rose or set. Well, I suppose you always need to be careful what you wish for! We had fog everyday of our trip, but only one brief opportunity to be above it on our first evening there. The fog settled in heavily and hung around for basically our entire trip, except for a few breaks in the middle of the day. So while I didn't score the images I was dreaming of, we were offered a totally different experience than last summer -- we now realize how lucky we were to have four completely clear days in the park last year! Of course, I've also written many times on this blog how living in the San Francisco Bay Area taught me to appreciate the inherent beauty of coastal fog, and this trip made me stand by those claims. I tried my best to embrace the fog that enveloped Mount Desert Island, which meant stepping back from expectations of the grand landscapes of coastal Maine, and instead focusing in on the smaller, but still remarkably beautiful landscapes available at closer range. This pair of photographs was taken from the shoreline of Upper Hadlock Pond on our final morning in the park. Once again, we scratched our plans to arise well before sunrise as the forecast was calling for the heavy fog to hang around. We chose the path around Lower Hadlock Pond for our morning hike, but I couldn't pass up this view of the fog descending the hillsides as we passed by the upper pond. 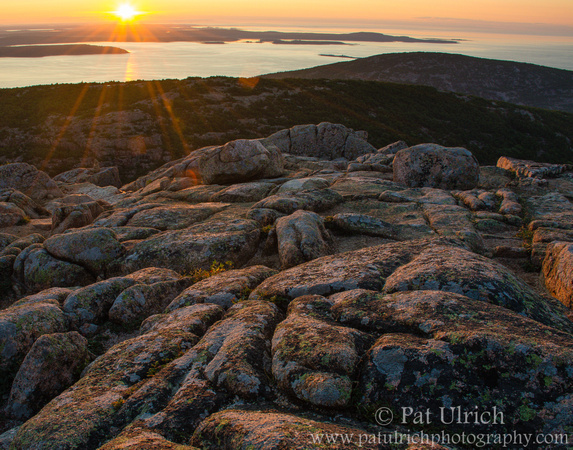 View more photographs of the impressive landscape of Acadia National Park. I'm already looking forward to a trip to Acadia National Park in August. I'm keeping my fingers crossed that the weather will cooperate and provide some coastal fog for a sunrise from the summit of Cadillac Mountain. One photographic regret I have from my years in the SF Bay Area is that I didn't spend more time photographing the sunset from above the fog on Mt Tam. I'm always drawn into these kinds of pictures, and we'll see if I'm lucky enough to have a chance up in Maine. Regardless, I know Acadia will be a very fun vacation for my dog, who had a blast in the park last year. Anyway, this was one of my personal favorites from last year's Acadia trip. I enjoy the cool colors of the predawn light before the warmth will soon explode over the horizon. I like too that you can see the headlights of a car as it makes its way up the road to the summit to join the throngs of people awaiting the rising sun. 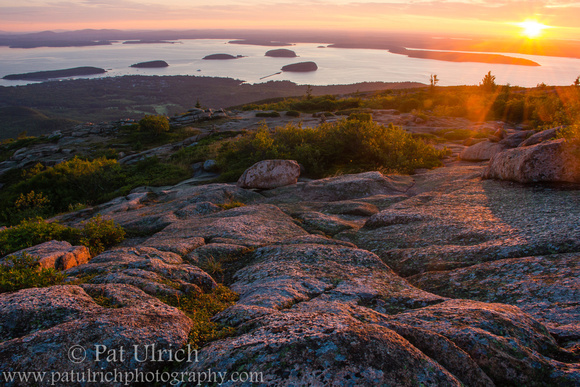 View more photographs from Acadia National Park in Maine. Well, 2014 is drawing to a close and sights are locked on our next revolution around the sun. Each morning that I'm able to experience the sunrise leaves me feeling refreshed with the anticipation of a new day, with all the stress of the prior day behind me. In some ways, this last day of year is the same. A chance to reflect on what was and to look forward to what will be. 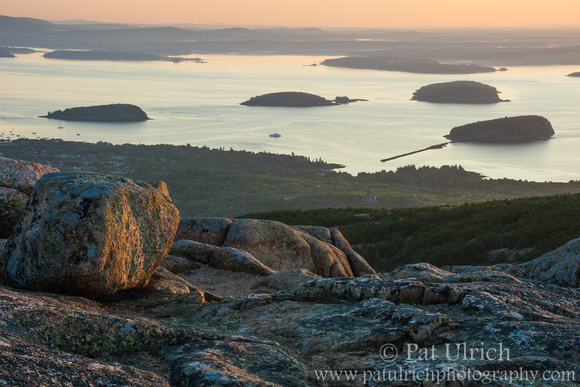 I chose this image from the summit of Mount Cadillac in Acadia National Park as one of my favorite photographs of the year. For me, it embodies that invigorating feeling of the cool morning air and warm first rays of sunshine awakening my senses and nourishing my soul at the dawn of a new day. I wish all of my followers a happy, healthy, and productive new year -- with as many inspiring moments spent in golden light as you can handle! "Dad, what are we doing here? Is this really why we woke up at 3:30 this morning?" I had some assistance as I photographed the sun rising over the Schoodic Peninsula in my prior post. 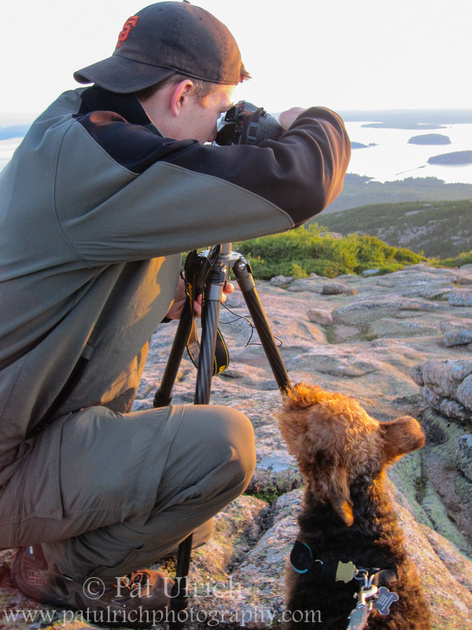 My dog usually gets left behind when I'm going out to do photography, but he participated in our entire trip to Acadia National Park -- and he had the time of his life! 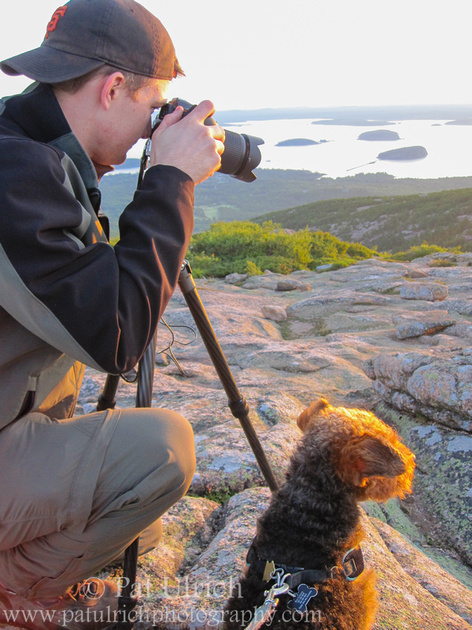 Acadia is a great destination to travel with a dog, as both the National Park itself and the surrounding towns are remarkably dog-friendly. Dogs are allowed on most of the trails in the park (with the exception of a few that are particularly difficult and unsafe for four-legged companions) and it was easy to find restaurants with outdoor dining areas that welcomed dogs. We were even able to bring him shopping with us in a variety of little shops in downtown Bar Harbor that had posted signs in their windows inviting dogs inside. Acadia is going to be a regular summer destination for us, and it's great to know that there is such a wonderful place to visit without having to leave a certain member of the family behind! By the way, if anyone in the Boston area is looking to adopt a homeless pet, we had a great experience at the Northeast Animal Shelter in Salem, MA a few years ago. The staff were really great with helping us to find an adult dog that fit our personality and lifestyle. Our dog has brought so much joy to us over the years, and there are many more at the shelter just like him who are looking for loving families! One of life's true simple pleasures is seeing the sunrise. This is especially true when you can witness the spectacle from a gorgeous location like the summit of Mount Cadillac in Acadia National Park. Even in mid-August, when we took this trip to Maine, the sun was still rising rather early (around 5:30). But as the colors filled the sky, and the warm golden-light broke the horizon above the Schoodic Peninsula, all sense of fatigue melted away and the excitement of the start of a new day filled its space. 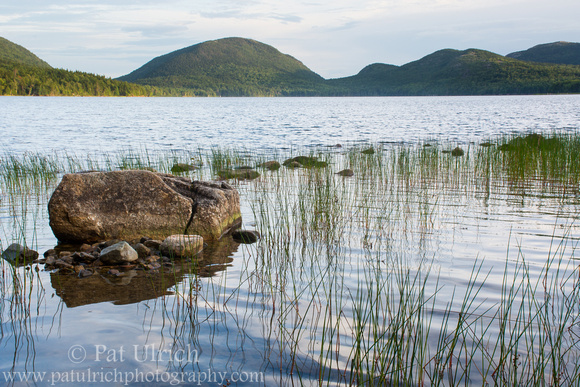 On our first evening in Acadia National Park, we decided to take in the sunset at Eagle Lake. We hadn't done much scouting before the trip and ended up here just on a whim while looking at the park map. It was a lovely stroll along the carriage road on the northern edge of of the lake, with nice views of Pemetic Mountain and the Bubbles all along the way. While our trip to Acadia National Park was not explicitly for photography, it's hard to be in such a beautiful place without wanting to take advantage of the golden hours. Seeing the sunrise from the summit of Mount Cadillac is something I would have wanted to do anyway -- it's not everyday that you get to be in the first place in the U.S. to witness the sunrise (well, at least it holds that distinction in the winter months) -- but it really is a "thing to do" there. While the photographers visiting Mt. Desert Island would surely be used to waking up at 3-something in the morning in order to reach their destination by sunrise, I was shocked at the number of visitors who lined the summit each morning. What surprised me more though was how quickly almost everyone jumped back into their cars only a few minutes after the sun had fully emerged from below the horizon. 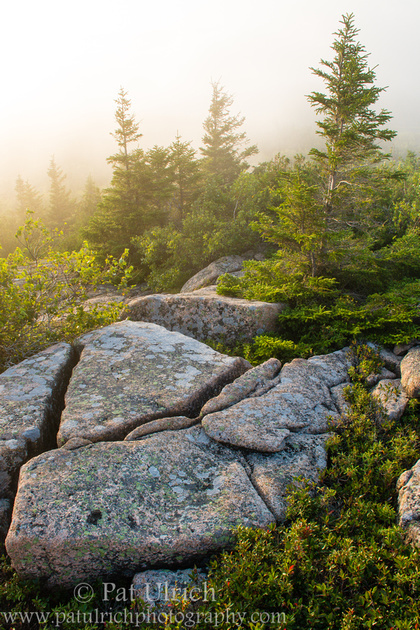 View more landscapes from Acadia National Park. My wife and I took a much needed final summer trip to Acadia National Park a few weeks ago. We've been wanting to see the park ever since moving to New England, and it did not disappoint! 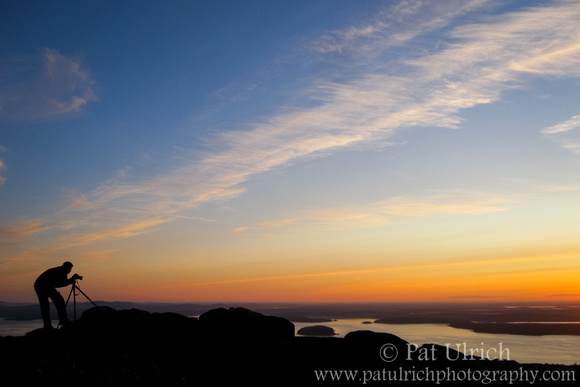 Two of our three mornings in the area we headed up to the summit of Mount Cadillac to catch the sunrise, which was a definite highlight of our time there. 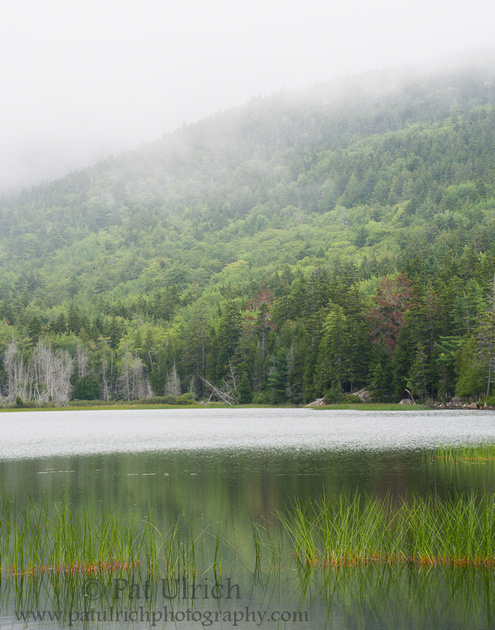 Acadia is certainly not a park to visit if you're hoping to photograph wildlife, but the landscapes are incredible. There's something very special about the mix of granite, water, trees, and sunshine on Mount Desert Island and I can't wait to return!